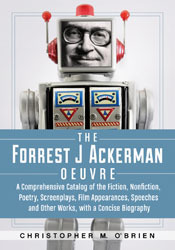 Christopher M. O’Brien’s The Forrest J Ackerman Oeuvre is now available from McFarland. For the benefit of those who only know the French they learned from Pepé Le Pew, ouevre means a substantial body of work constituting the lifework of a writer, an artist, or a composer. A bibliography listing Ackerman’s fiction, nonfiction, poetry, screenplays, film appearances, speeches and other works, plus a filmography and concise biography, fill the book’s 242 pages. This includes a foreward by Dennis Billows who met Forry at the San Diego Comic-Con around 1975 and spent his free time for the next 20 years organizing his collection. Billows also worked as assistant editor of Ackerman’s magazine, Famous Monsters of Filmland. O’Brien has spent more than a decade researching the pulp magazines and early science fiction fandom. His fannish credits include an article about William Hamling in Earl Kemp’s eI #55. This entry was posted in Like Show Business and tagged Earl Kemp, Forrest J Ackerman, William Hamling by Mike Glyer. Bookmark the permalink. Chris O’Brien has written several articles on old fandom (and prodom) for the magazine FILMFAX.